State Sen. 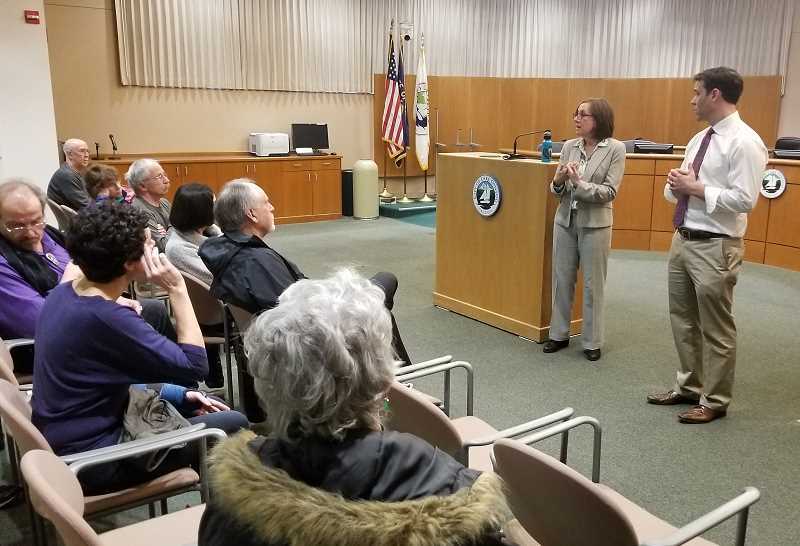 Rob Wagner (D-Lake Oswego) and State Rep. Andrea Salinas (D-Lake Oswego) held a Town Hall in Lake Oswego on Tuesday to talk about the 2018 legislative session. The discussion focused on a number of bills, including Senate Bill 1562, which toughens the legal charges for strangulation, and House Bill 4005, which is aimed at increasing prescription drug price transparency. But the biggest issue on the minds of the roughly 40 audience members at the City Hall event turned out to be gun violence and gun control, and the topic ended up dominating most of the discussion. 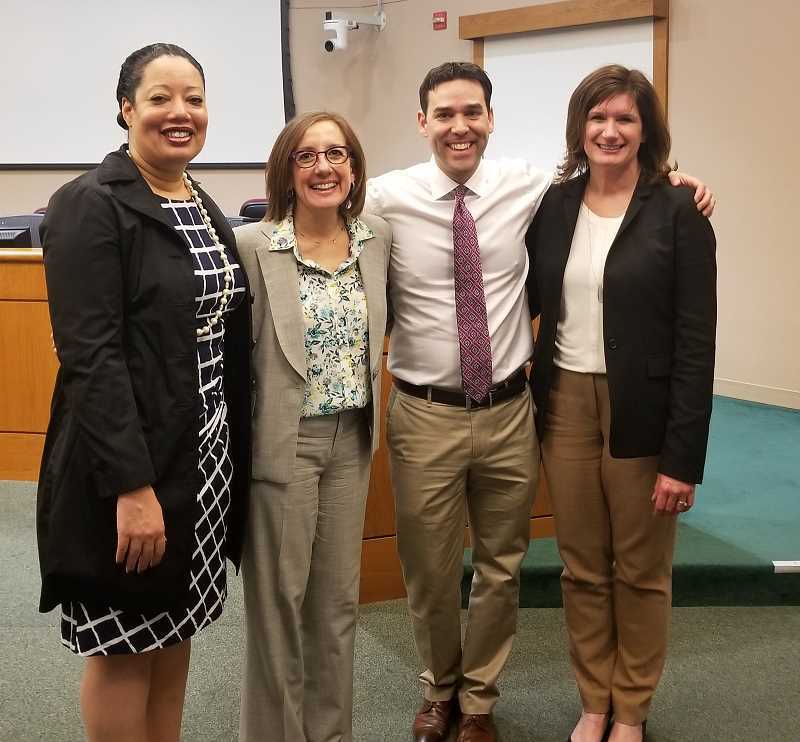 At the outset, Salinas and Wagner talked about House Bill 4145, which closed a loophole in Oregon law by giving police the power to confiscate firearms from a person's intimate partner if the partner has a domestic violence conviction or stalking order. Under prior Oregon law, officials could only confiscate weapons if the abuser was married to the victim. The signing ceremony for the bill was attended by roughly 200 students from Lake Oswego's high schools, who traveled to Salem earlier this month to lobby Wagner, Salinas and other representatives and campaign for stricter gun control. "They're leading the charge in this country," Wagner said, "and I couldn't be prouder of the students." Wagner and Salinas said they saw strong support for gun control within their districts, but both legislators said they were also frequently contacted by individuals and groups like the NRA who urged them not to pass any new gun regulations. Wagner said that at one point, his office received more than 300 emails per day in opposition to gun control. But several audience members suggested additional gun control actions are needed, such as restrictions on selling firearms, state-level funding for research into gun violence and tighter interpretations of the Second Amendment that would emphasize the phrase "well-regulated." Salinas noted that a portion of the funding in HB 4145 is intended to go toward a joint OHSU/PSU study that will look at violence prevention, and Wagner also recommended that audience members learn more about the Safe Oregon program, which gives students and parents a resource to report potential safety threats. Salinas also said the Legislature is approaching the issue of gun violence holistically, with additional goals like expanding access to mental health care and increasing funding for radio equipment upgrades so police can better communicate with each other during a crisis. A few audience members pushed back strongly against the idea of regulation, urging lawmakers instead to focus on protecting schools rather than restricting guns. Wagner said he disagreed about gun control, but discussed the school protection issue by citing his own experience as a member of the Lake Oswego School Board, which has been working to implement a recently passed bond measure that will pay to rebuild one of the district's schools and upgrade several others. Wagner said that as part of the bond, planners are looking at a number of security-focused design choices that are becoming standard practice for new school construction, including vestibule areas that make it harder to gain entry, exterior door locks and campus designs that have fewer access points, making it easier for law enforcement to secure the location. "We just aren't going to be building schools like we built them in the past," he said. Salinas and Wagner both have prior experience working as lobbyists in Oregon's capital, but they were each appointed to their current seats in just the past seven months, making this year's session their first as legislators. The two are longtime friends, and Wagner said they stuck together during the session, often carpooling down to Salem. "Truly, it's been a trial by fire," Wagner said. As a freshman senator, Wagner said he didn't get much say in terms of his committee appointments — he was named to Senate Judiciary and Senate Human Services — but he said he ended up finding both positions to be "not only fascinating, but exceedingly rewarding," particularly because he was able to work on gun control legislation. Salinas successfully sought an appointment to the House Health Care Committee and worked on HB 4005, which requires drug manufacturers to provide an explanation if a drug's price jumps by more than 10 percent. "This bill won't decrease costs overnight," she said, "but I think the pharmaceutical industry doesn't want to have to open up its books to the states." She characterized the bill as a starting point; in response to audience questions about Medicare access and the price of insulin, she stressed that "we're not done" and said she would be pursuing future legislation to try to directly lower drug prices. One audience member asked what happened to a proposed cap-and-trade bill, which had been one of the Democrats' top goals for the session. Salinas said that while the legislation didn't pass, lawmakers felt that they got a strong commitment toward eventually passing it, particularly because funding was allocated for Oregon's Department of Environmental Quality to begin studying available data to create a more precise recommendation. She also noted that Senate President Peter Courtney had committed to making sure the legislation comes back up, and Wagner predicted that it would pass in the 2019 session.